I like to think my sense of adventure is up there. I bungee jumped long before everyone and their grandma did it. I will try just about anything edible or drinkable you can throw at me (and I've probably reviewed it here somewhere). I've even -- gasp! -- worked retail on Black Friday. Really, there is no limit to my daredevil side. So when I got an email from the good people at Gail Ambrosius asking me if I would like to review one of their truffle collections, I grabbed my Indiana Jones hat and waited, somewhat patiently, for them to arrive. 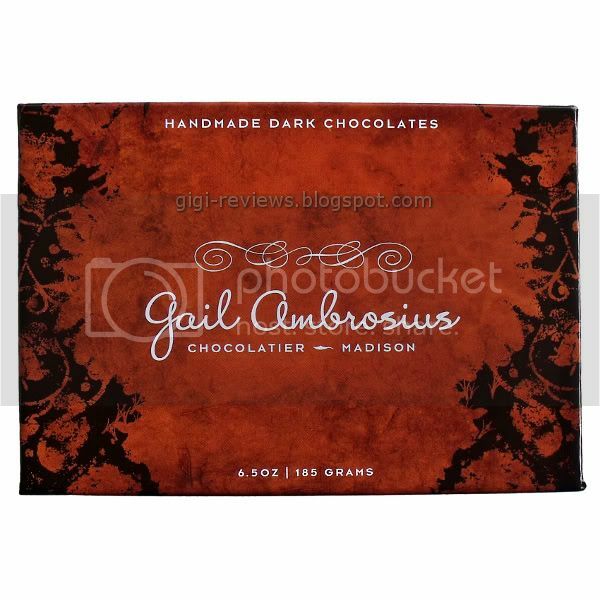 Gail Ambrosius is an old school chocolatier who -- along with her staff, of course -- makes all of her single origin chocolate by hand in small batches. Kinda made me think of a chocolate version of a micro-brew. Gail's chocolates, in addition to being single origin, are also free of preservatives, with all natural, sustainable ingredients. (And since there are no preservatives, their lifespan is brief. 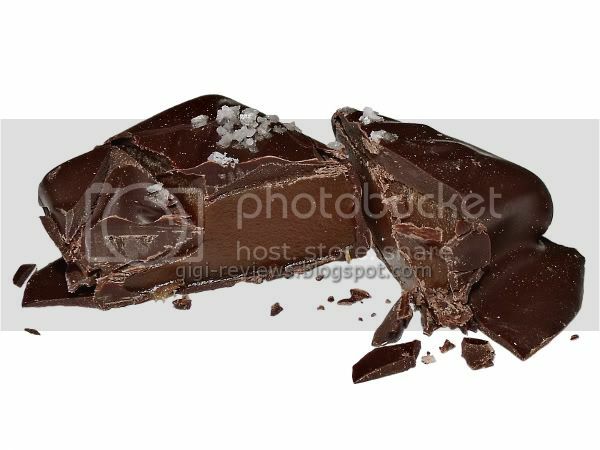 These are not chocolates you can leave on a shelf and forget about for a couple of months.) Gail is clearly head over heels in love with her craft. If you read her blog -- or her biography on her site -- it is impossible not to sense how much she loves what she does. 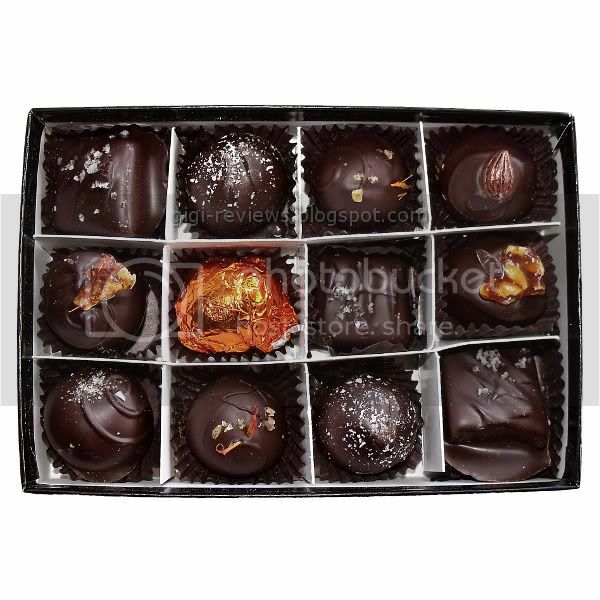 I personally love a good truffle too, as my past truffle reviews reveal, and I was very excited about the six truffles in this collection. 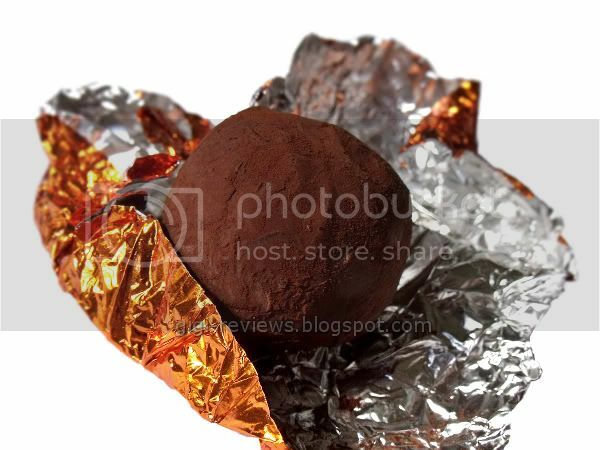 This truffle was wrapped in a bright orange foil. Hidden underneath the foil is a truffle made up of 65% Colombian chocolate, dusted with a fine layer of cinnamon. 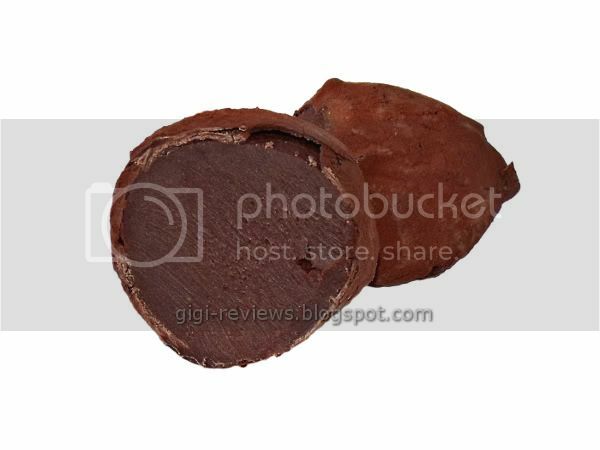 What I loved about this truffle was that the incredibly smooth chocolate is just sweet enough that it is not bitter, but you wouldn't mistake it for a milk chocolate. The cinnamon is actually the first thing you taste. It's spicy but not overpowering. The best part is the heat from the cayenne, with just a teeny tiny peppery aftertaste. 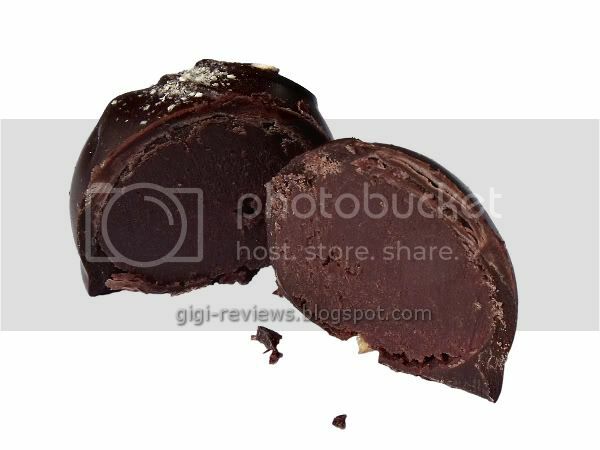 I could eat an entire box just of this truffle. 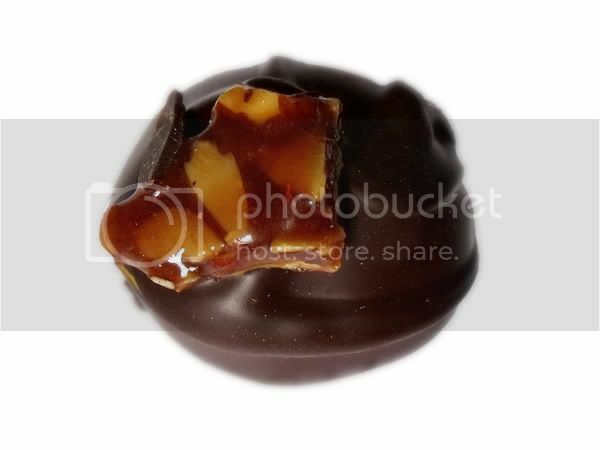 This truffle is made with Hawaiian chocolate. I can't say that I've ever had Hawaiian chocolate before, but it made me think of Marvo -- and that in turn made me think of Marvo doing the Truffle Shuffle -- which, for the record, I have never seen him do, but it sounds like something he would do. (Nothing but love for you, man, nothing but love!) All of that distracted me from the fact that this truffle also contains coconut. And coconut is my natural enemy...well, that may be going a little far. But it is safe to say I am not the biggest fan of the stuff. This truffle also has coriander, turmeric, cumin, and cardamom and the top is sprinkled with strands of saffron -- world's the most expensive spice. This truffle smells vaguely like generic Indian food. The turmeric and the cumin were the strongest flavors. I picked up the coconut more as an aftertaste. 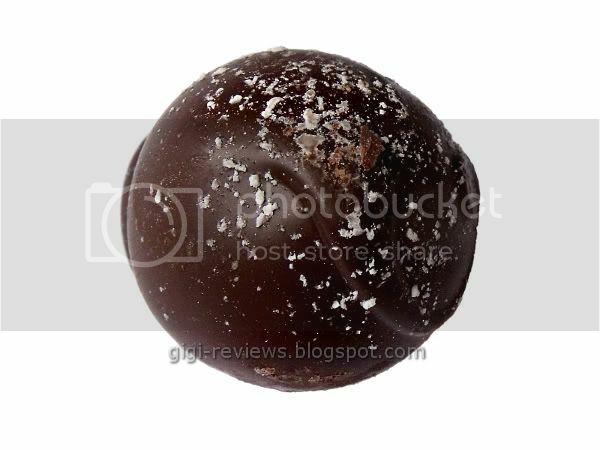 The information for this truffle describes the chocolate as having a raisin-like aftertaste -- and damned if that's not the best way to describe it. Honestly, while I liked the spice and I liked the chocolate, the coconut killed this truffle for me. But I am sure coconut fans would love it. 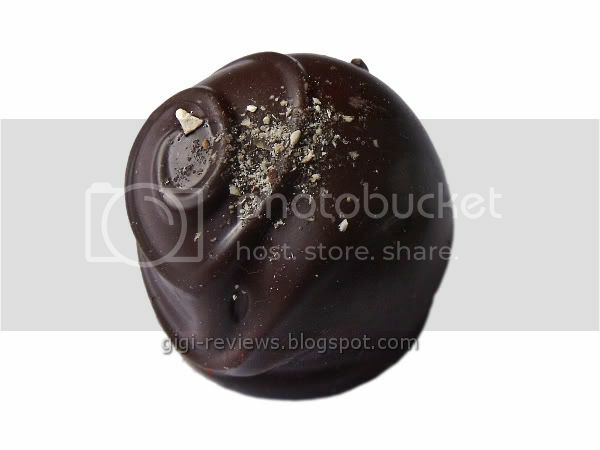 This truffle is filled with a ganache that is made with 65% Peruvian chocolate nibs that have been caramelized. There is also a hint of cinnamon and vanilla. 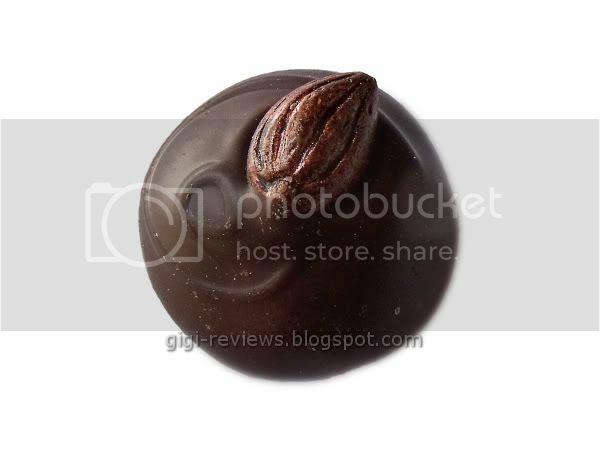 The truffle is topped with candied almonds. This truffle is like chocolate to the eleventh power. It's a little sweet, and you taste just enough of the cinnamon and the vanilla so that you know they're there, but otherwise it is just pure chocolate essence. 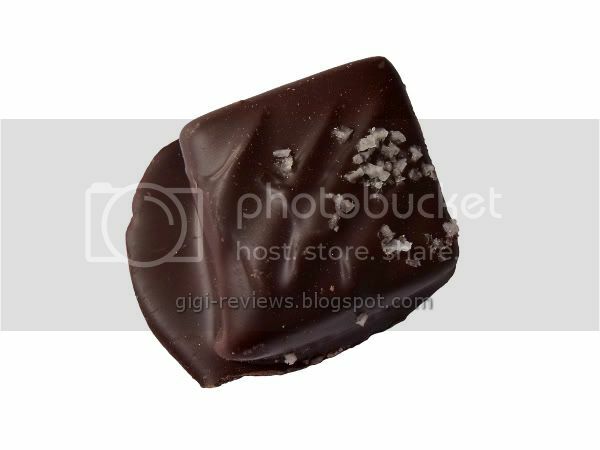 The nibs are almost completely ground, but there are little chunks here and there that add crunch to the otherwise smooth filling. Very nice! This one reminded me of Thai food. The chocolate is a 70% Venezuelan chocolate that is infused with dried organic lemongrass, coconut purée, and ginger pulp. 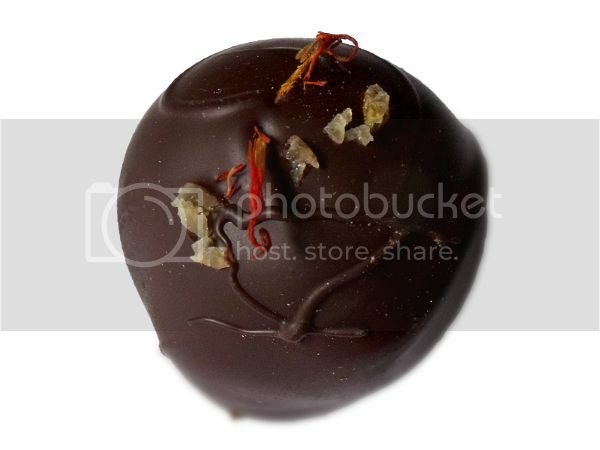 It is topped with candied lemon peel and dried safflower. Even with the coconut I loved this truffle, mostly because the strong warmth of the ginger worked to cover up all but the last notes of the coconut. 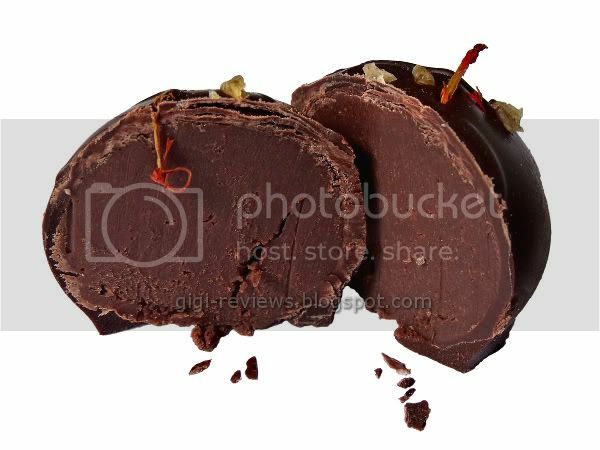 The lemongrass gives it a fresh clean taste, and the dark chocolate just wraps the whole thing up in an earthy blanket. This one is made with chocolate that Gail herself treks to Costa Rica to get. It's a simple truffle, made only with said chocolate, plus cream and vanilla bean. This is the most basic truffle in the mix. It is also a great example of how sometimes it is the little things that make the most impact. 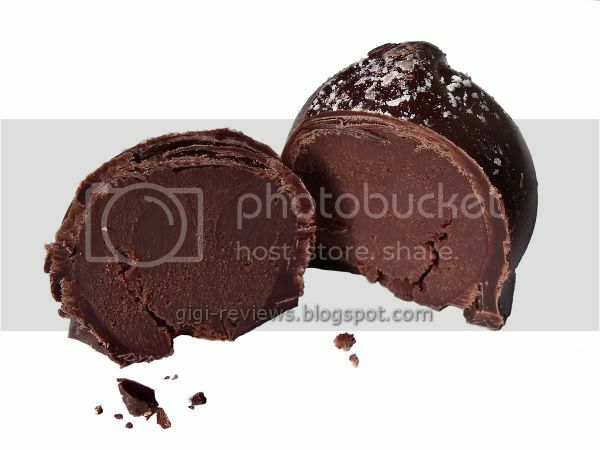 With this truffle, all you taste is the chocolate. It's a little fruity, a little coffee-like. It's sweetened by the cream. If you are just beginning to get into dark chocolates, this is an excellent place to start. Not going to lie -- this single truffle was the entire reason I chose this collection out of the others available. Seriously, how could you not want to try chocolate and mushrooms together?! 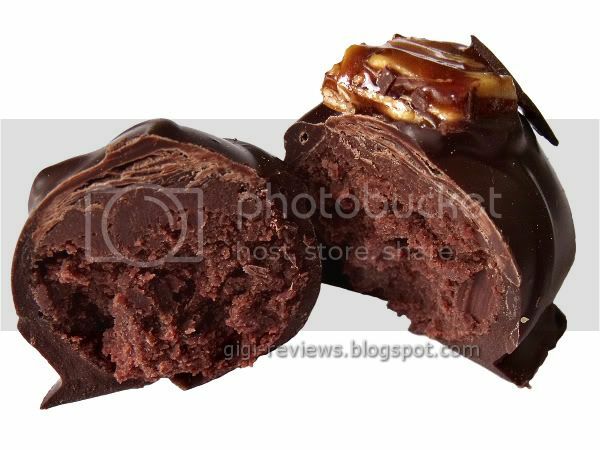 The chocolate is the 65% Peruvian, and is mixed with a mixture of dried shiitake mushrooms and cream. Anyone who says that mushrooms and chocolate do not belong together needs to be fed this truffle -- even if by force at first. The mushrooms bring a slightly chewy texture to the center. Paired with the dark chocolate, it tastes like fresh soil, coffee, woodsy happiness. It's sweet, it's salty, and it's probably going to become my new obsession. Yeah, this was a great collection. The texture of the all of the truffles, regardless of flavor/chocolate was excellent. Just enough snap on the outer shell. The interior ganache was silky smooth and cool on the tongue. 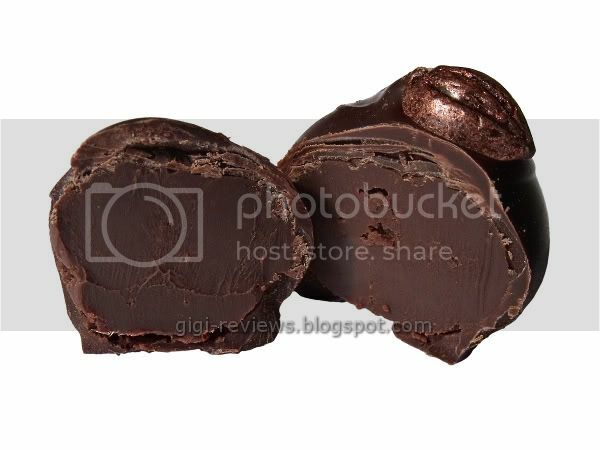 These are some of the best truffles I have ever had. While not listed as part of the Adventurous Collection, my box also contained a couple of the Caramel Sprinkled with Grey Salt squares. Not one to look gift salted caramel in the mouth (or share it willingly), I was thrilled with the addition. The Columbian chocolate is deep and coffee-like. The salt was everything you could ever hope for. The texture of caramel itself is super soft and smooth, almost to the point of being a butter cream. It's mildly buttery and sweet. It is at its best when you get a part of the square with a lot of salt on it. There was something about it that I just couldn't put my finger on -- and it kept me from deciding whether or not I really loved it -- or if I was really indifferent to it. But I still ate all of them, so I am leaning towards really liking it. Get your hands on this collection by any means necessary.